John Kosar , Contributor I have 37 years of experience forecasting global financial markets. Despite last week’s impressive rally going into a long holiday weekend, virtually all the key secondary indicators I use to measure the stock market’s near term internal strength are still negative. It would take a sustained rise next week above S&P 500 (SPX) 2730 to 2770, which is 3% to 5% above the market, and/or vastly improved market internals, to confirm that the US stock market is “out of the woods” and has resumed its larger 2016 advance. Chart 1 below plots the benchmark S&P 500 daily since August 2017 and highlights the key price levels both above and below the market. First and foremost, the chart shows that SPX has been testing its (orange) 200-day moving average, a widely-watched major trend proxy currently situated at 2589, since March 23rd, This is major decision point for the US broad market from which its next significant directional move, either higher or lower, is likely to begin. Should the 200-day MA hold as support, minor overhead resistance exists 4% above it at 2691, which represents the March 13th low. Above that, major overhead resistance exists 5% to 7% above the 200-day MA at 2730 to 2770, which represents the 50-day moving average (blue, minor trend proxy) and January 26th downtrend line (red). A sustained rise above 2770 would be necessary to confirm that the larger bullish trend has resumed and would target an additional 10% rise to 2050. Should support at the 200-day moving average be broken, however, it would suggest that a deeper decline is coming. The next two underlying support levels exist 2% below the 200-day MA at 2544 to 2533, and 4% below it at 2491 to 2488 (green). 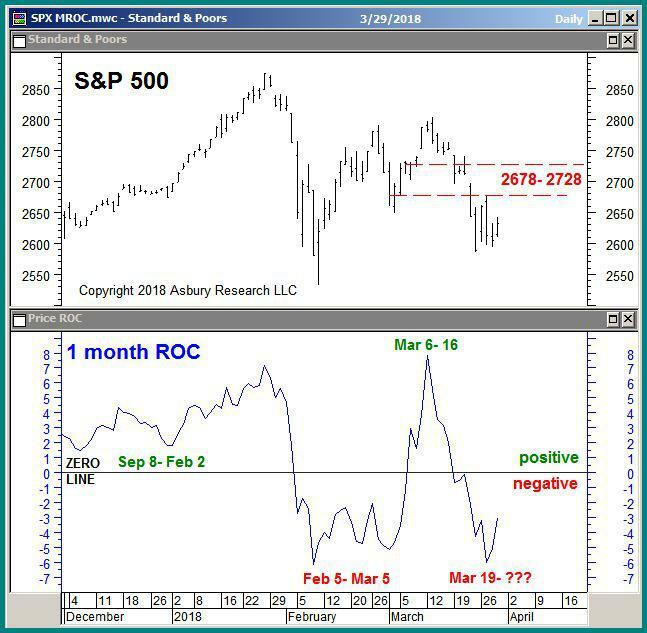 The red highlights in Chart 2 below show that the S&P 500’s 1-month (our tactical time frame) rate-of-change (MROC) turned negative on March 19th and will remain so next week below 2678 to 2728, which is 1% to 3% above the market — which closely corresponds to overhead resistance levels at 2691 and 2730 as shown in Chart 1 above. 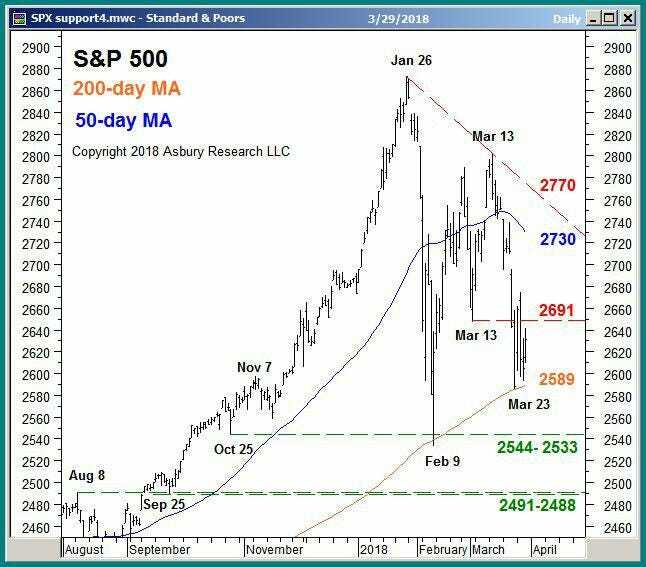 According to this metric, a sustained rise above 2728 would be necessary next week to turn near term momentum positive and thus confirm the larger broad market advance has resumed. While Charts 1 and 2 above lay out the parameters for both a positive and negative resolution to the US broad market’s current decision point at the 200-day MA, Charts 3-5 below indicate how the market looks right now, under the hood, going into the long holiday weekend. The blue line in the lower panel of Chart 3 below plots the daily total net assets invested in the SPDR S&P 500 ETF (SPY) since December. The red line plots these assets’ 21-day moving average, which we use to identify a monthly trend of expansion or contraction. Investor asset flows measure day-to-day investor conviction in a price move. 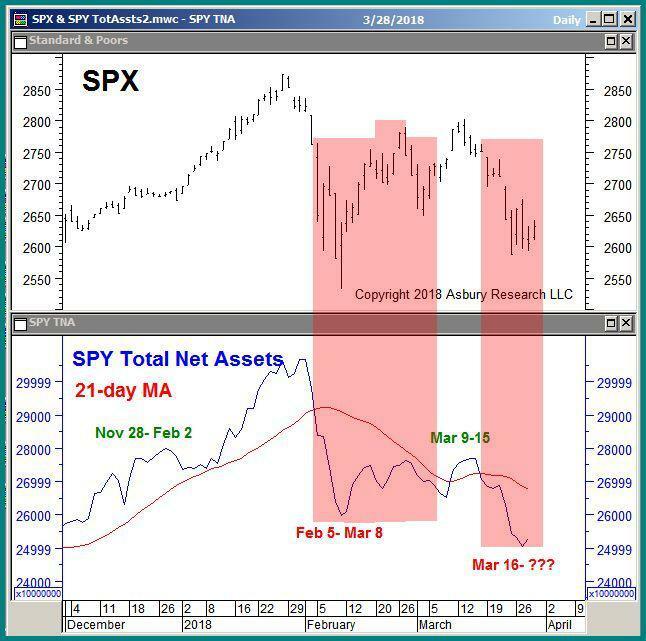 The red highlights show that these assets shifted to a trend of monthly contraction as of March 16th, and that the previous similar trend triggered and fueled the early February to early March weakness in SPX (upper panel). As long as this trend of monthly contraction remains intact, more near term market weakness is likely. 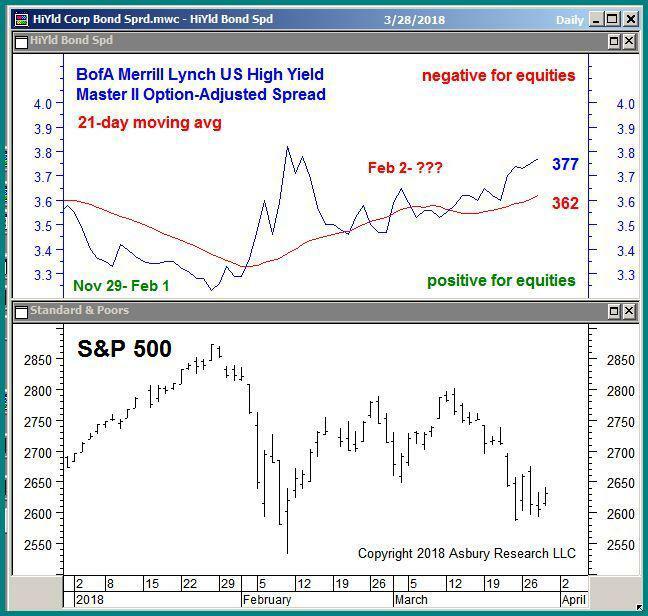 The red highlights in the upper panel of Chart 4 below show that the BofA Merrill Lynch US High Yield Master II Option-Adjusted Spread has been in the midst of a monthly widening trend, as indicated by its position above its 21-day moving average, since February 2nd. Monthly widening in the spread indicates the bond market is pricing in a near term increase in credit or repayment risk for these bonds, one that has historically coincided with a weak/declining stock market. As long as the spread remains in a trend of monthly widening, history suggests the stock market is going to have a tough time making and holding gains from the 200-day MA. Put another way, it would take a sustained narrowing in the spread next week, below its 21-day moving average at 362 basis points, to indicate these bond market fears have abated enough to support the beginning of a new leg higher in the US stock market. 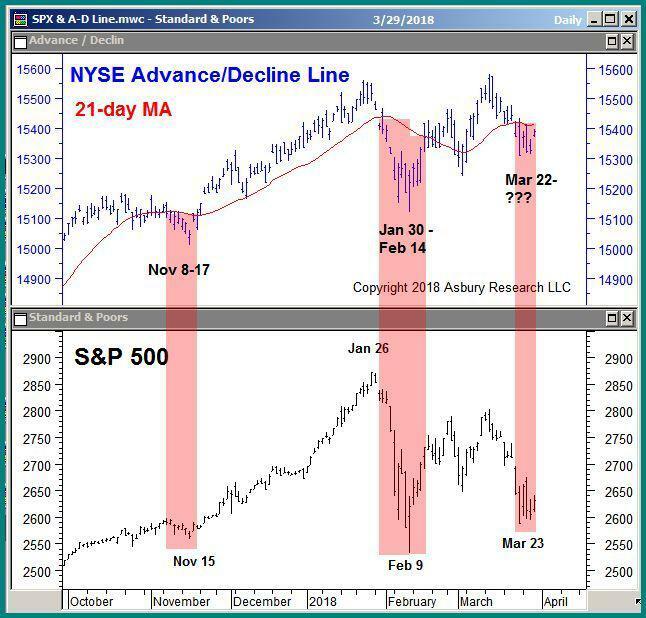 The blue bars in the upper panel of Chart 5 below plot the Advance/Decline Line based on NYSE common stocks, which is calculated from the percentage of advancing stocks minus the percentage of declining stocks. The red highlights show the A/D line has been below its 21-day moving average since March 22nd, indicating a trend of monthly weakening in market breadth, and that the previous two instances of this coincided with declines in the S&P 500 (lower panel) in early November 2017 and in early February. It would take a sustained rise in the A/D next week, back above its 21-day moving average, to indicate that market breadth is once again strong enough to fuel and sustain a broad market rally. John Kosar CMT is Chief Market Strategist at Asbury Research LLC, an independent provider of technical and quantitative financial market research, and is a Managing Principal at Asbury Investment Management LLC, which brings professionally managed Asbury Research investment ideas to individual client portfolios.